A mystery, I divided the unidentified mound of roots and leaves, watching it grow, expectantly waiting for blooms. Never did I anticipate the delightful round globes, like petaled sunshine, that emerged: globeflower, (Trollius europeaus). 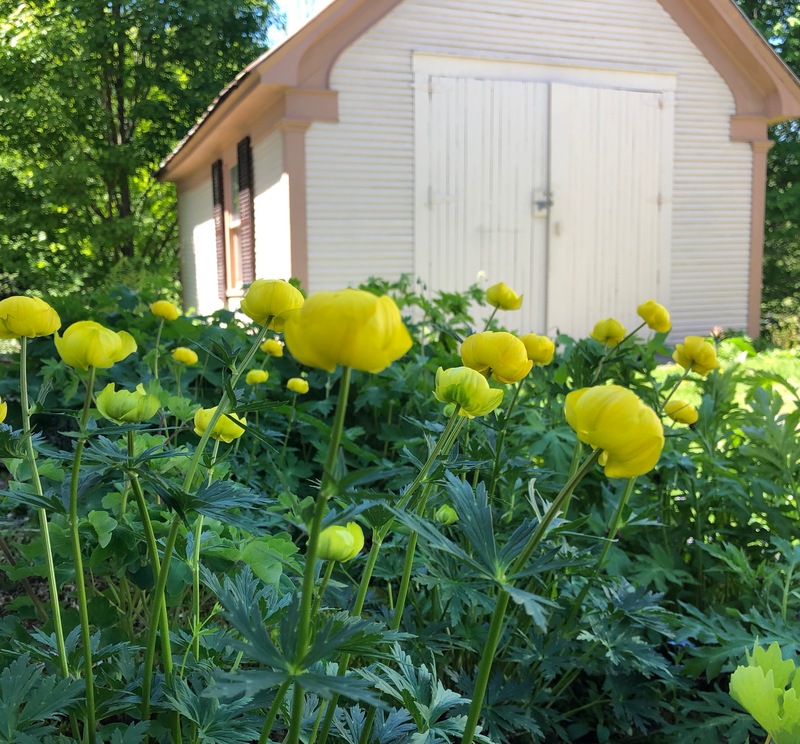 Of all the plants from Silvia’s garden, the globeflower is my most treasured. It is the plant I wish she had given me with her own hands, had I been brave enough and wise enough to approach her. I’ve imagined that conversation many times. The exchange of plants that all gardeners love. Perhaps she would have let me help her weed her beds. Her voice. Her knowledge. Her stories. When I was a young girl, I weeded the beds of an elderly neighbor for pin-money once a week. Those gardens, like Silvia’s, were filled with plants from a long life and, like any cottage garden, a bit of a riot in color and design. Frail, with a beautifully etched face, all line and wrinkle, the neighbor of my youth would guide my young hands in the weeding, and in the process tell me the stories of her garden, associations from when she was a young girl growing up during the Great Depression and later a young woman, married without children. I never made a lot of money, but I loved her plants and eagerly listened to her stories. I imagine I might have listened to Silvia in the same way. Dirty hands and a listening ear. But Silvia’s voice no longer carries in the wind of her garden, although sometimes I feel it echoes like a mist around her plants; a private language of flowers – memories and written words. I read aloud her story, listening to her voice and listening to the globeflowers which hold a story. A story of a first romance, captured in the bloom of a flower that never opens. At Viinamärdi, the farm in Nöo where Silvia spent her summers, globeflowers amassed beneath the stands of old birch trees, a contrast of white bark carpeted in golden spheres. At the time, Silvia was in her second year at the University of Tartu a short distance from the farm in Nöo, yet, like other students she roomed in the city. As a birthday surprise for her landlady, Silvia made an overnight visit to the farm to gather the blossoms of her landlady’s favorite flower. At the train station, Silvia encountered Richard, a fellow student who a few months prior had showered Silvia with compliments at a dance, after which they had spent the evening talking in the park on the banks of the Emajõgi River, but for reasons unknown to Silvia at the time, they hadn’t seen each other since. At the train station, Richard, loaded down with books, was heading to the country, where he would stay for the summer at a house two stops past Nöo. Silvia didn’t get off the train that night at the farm. In the morning light, Silvia’s jet black hair gleams with blue highlights, her radiant face is perfectly framed by the golden bouquet of globeflowers – so immense both arms can barely contain the beauty – the exuberance of a girl yet twenty. Globeflower (Trollius europeanus) grows as a wildflower in Estonia (commonly called kullerkupp). It is rather difficult to find in nurseries in the United States, although I have seen it offered with greater frequency in the past couple of years. Silvia found it difficult to propagate by seed and I have not tried, preferring division. It prefers damp and fertile areas for growth. My plants from Silvia’s garden grow in partial shade.